Written on April 6, 2015 . Posted in Announcements + Updates, Research. As part of the newly launched Robert L. Turner Theatrical and Performance Design initiative, students collaborated with the Providence Ballet Theatre company to design sets and costumes that support an original ballet. 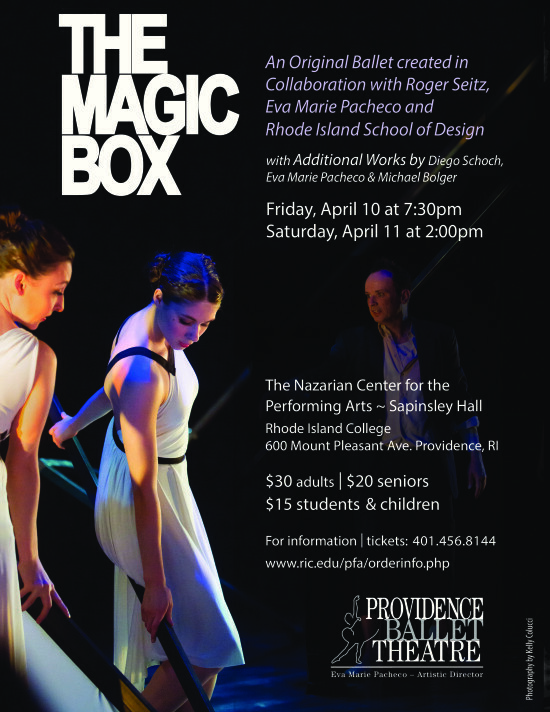 Students worked with RISD faculty Jane South (Critic, Sculpture), Michael McGarty (Critic, Interior Architecture), Eva Marie Pacheco, artistic director and choreographer of the Providence Ballet Theatre, and collaborative advisor Li Jun Lai to design sets, costumes and staging for the 40-minute ballet, an original piece created by Pacheco and Rhode Island composer Roger Seitz. This groundbreaking collaboration around The Magic Box is the first in a new initiative funded by residential interior designer Robert L. Turner 74 IL, a theater devotee interested in helping current students pursue studies in theatrical design.